My sweet twins are four and soon to be five-years-old. When my husband and I found out we were going to be parents, we were elated. I had had two previous miscarriages and one was ectopic and resulted in the loss of a fallopian tube. I had a feeling that this time the pregnancy would stick. My doctor only does one ultrasound at 18-22 weeks, and since this was my first staying pregnancy, I didn't start to show until later. We found out that we were having twins at 19 weeks. My doctor was unfamilar with mono-mono twins, so she told us that she would study about it and send us to a perinatologist. We then started our weekly visits and ultrasounds. I loved getting the constant updates and views of my little boys. At my 24 week apppointment with the perinatologist I was told that hospital stay was probably in the future because the boys cords had become entangled. My doctor called the next Monday and at 25 weeks I checked into the hospital for what ended up being a 7 week stay. The scariest part was when the NICU staff came in to discuss each week of progression and what that meant for my babies and the possibility of their survival. I stayed on a permanent heart moniter for those 7 weeks. I was allowed two-15 minute walks and a shower each day. Once a week I walked down the hall to radiology for my ultrasound and prayed that all was well and the boys would be able to stay in the womb for a little longer. 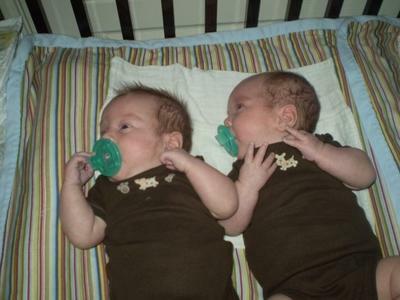 At 31 weeks Adrian began having dips in his heart rate and showing signs on the ultrasound of twin to twin transfusion. I was given a steriod shot to help speed up the boys lung growth and plans were set to deliver me at 32 weeks. Adrian was born first and weighed 3 lbs 11 ounces and Julian weighed 4 lbs. Adrian had trouble breathing and required alot of medical help to survive those first moments of life. I was unable to see him at delivery as they worked to get him stable, but Julian came out screaming and I was able to see him before he was whisked away to the NICU. They were five days old before I was able to hold them and it was wonderful. They cried so much, and I felt so helpless not being able to hold them or comfort them. They are now wild, rambunctious boys. They run and play non-stop and are normal healthy boys.